Somewhere out there, there's a guy with a smashing grapes tatttoo who can tell you why it's a bad idea to get a briefly amusing Youtube video tattooed onto your body. in a few years nobody will understand the joke ! 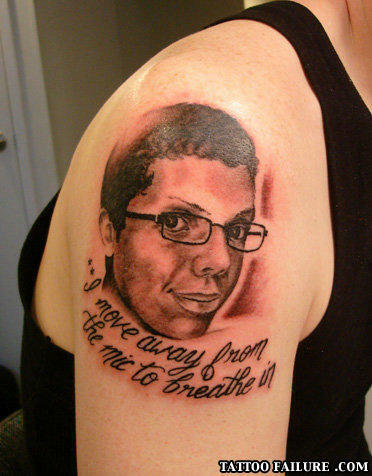 That's actually a pretty sweet tattoo of Tay Zonday. For all of you who don't know what it means, it was just a little annotation on his video of him singing "Chocolate Rain" and after each line he would turn away from the mic to breathe in... Yeah. **I move away from the tattoo parlor to immediately regret my decision. Now you're a member of the cool kid club. Why did Hitler kill six million Jews? Because one of them looked at him funny. Boy- Can I buy you a drink? Girl- Sure, after seeing your face I'll need the strongest thing that they have. "Lancia did have some issues; for example, the Gamma exploded every time you turned the steering wheel"